Here is an innovative idea by Shimmers Production Services, to make good out of bad, to turn fear into faith. This Halloween, they are planning a programme to raise awareness for the prevention of cancer, particularly breast and cervical cancer. Fair Life Africa was called in to lend its voice to this initiative, and we are happy to support it. It truly will be a party with a difference. Shimmers is providing free breast and cervical cancer screening for all women in attendance, by well trained and highly professional female doctors. The first 50 guests will get a free mask, welcome cocktail drink and cupcake! The party will hold at 61b Adeola Odeku Rd, Victoria Island, Lagos, from 10pm. 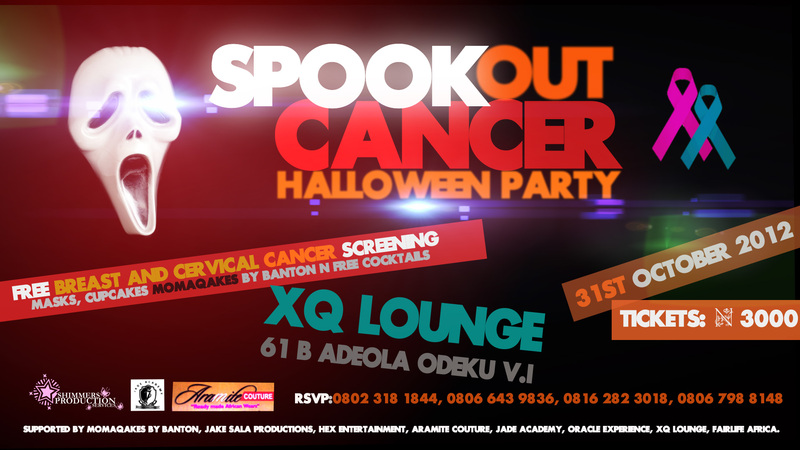 The ticket price for the party is N3000 only and is valid for a whole week (to allow more time for screening after the event), so come and spook out cancer! For more information and ticket bookings, please contact Lucia Ikediashi on 002348023181844. Shimmers Production Services promises to throw several themed parties as a platform to reach out to as many women as possible to curb the cancer death rate, and also to provide many ladies access to breast and cervical cancer screenings. Please support the initiative by mobilising your networks. You can start by liking this post and tweeting or facebooking about it. Please mark the 31st of October 2012 on your calenders for a day to make a difference. Save the flyer, and spread awareness about the party via Facebook, Twitter, Linked In, Blackberry and all social media platforms. Thank you and look forward to seeing you there!